What is a Water Benefit Certificate? Water has been repeatedly named by the World Economic Forum as the single biggest risk the world faces. These threats are only exacerbated by increasing temperatures and changing weather patterns. Water Benefit Certificates represent quantified and certified impacts to securing access to water – the most fundamental human need. A Water Benefit Certificate (WBC) represents a volume of water that has been sustainably supplied, purified or conserved. Why finance Water Benefit Certificates? Purchasing Water Benefit Certificates allows organisations committed to water stewardship to contribute to high-impact projects around the world that would not have otherwise happened. Each project must demonstrate a clear financial need for additional finance from selling Water Benefit Certificates to be certified. Above and beyond these water benefits, each project must also deliver impact toward two additional Sustainable Development Goals. 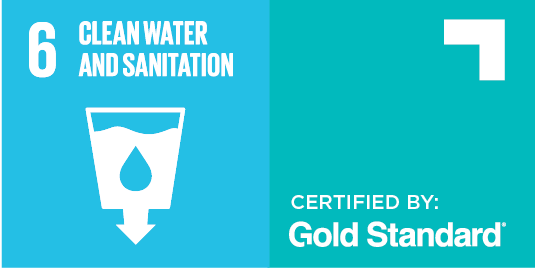 By purchasing Water Benefit Certificates, you can claim to have made a contribution to SDG 6, representing a direct impact on ensuring the availability and sustainable management of water and sanitation for all, monitored, verified and certified by Gold Standard. Target 6.1. Achieve universal and equitable access to safe and affordable drinking water for all. Target 6.2. Achieve access to adequate and equitable sanitation and hygiene for all and end open defecation, paying special attention to the needs of women and girls and those in vulnerable situations. Target 6.3. Improve water quality by reducing pollution, eliminating dumping and minimising release of hazardous chemicals and materials, halving the proportion of untreated waste water and substantially increasing recycling and safe reuse globally. Target 6.4. Substantially increase water-use efficiency across all sectors and ensure sustainable withdrawals and supply of freshwater to address water scarcity and substantially reduce the number of people suffering from water scarcity. In your communications, you may also describe the contributions to other Sustainable Development Goals that the project you supported has delivered. Water Benefit Certificates were developed with support from First Climate. Gold Standard for the Global Goals is a next-generation standard designed to accelerate progress toward climate security and sustainable development. This standard enables initiatives to quantify, certify and maximise their impacts toward the Paris Agreement and the Sustainable Development Goals, with enhanced safeguards, holistic project design, management of trade-offs and local stakeholder engagement to ensure the highest levels of environmental and social integrity.